A three-phase hybrid model of payments for social grants between the South African Post Office and Sassa announced on Sunday will hopefully make it harder for private corporate interests and a connected political coterie to benefit from one of government’s largest programmes – the R10-BILLION monthly payout of social grants. The “landmark” agreement could only be reached by cauterising the influence of Minister of Social Development, Bathabile Dlamini, and Sassa officials. There were many casualties along the way. By MARIANNE THAMM. There is no doubt that Minister of Social Development Bathabile Dlamini, who has on several occasions opted to campaign on behalf on the ANC and Nkosazana Dlamini Zuma in particular instead of accounting to Parliament, will claim a victory for the ruling party after Sunday’s announcement that a “landmark” agreement between SAPO and Sassa had been reached for the future payment of social grants. 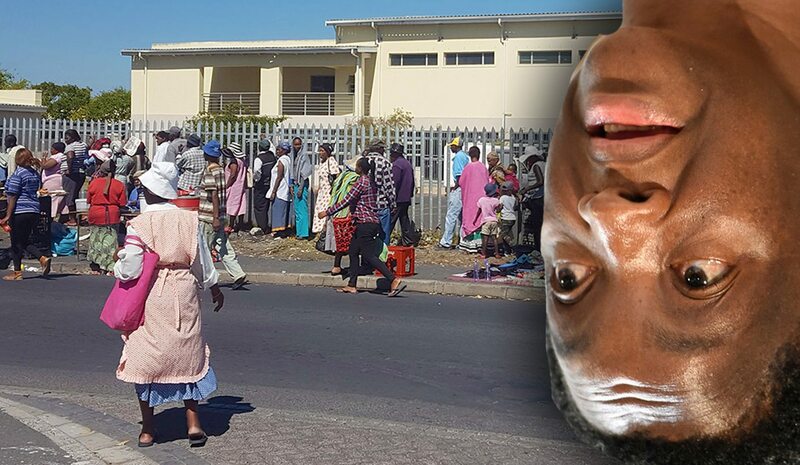 Dlamini has been at the heart of the chaos that ensued when the Black Sash was forced in March to take the minister and Sassa to the Constitutional Court at the last minute as the current irregular contract with CPS was coming to an end with no indication that Sassa had done anything meaningful to transform itself into a paymaster for the grants. Dlamini will in January still have to explain to the court why she, as the politically accountable official, should not personally be held responsible for the legal costs of the Black Sash ConCourt case. It was also Dlamini’s interference that resulted in the resignation of new Social Development DG Zane Dangor, who resigned in March, as well as the axing of new Sassa CEO Thokozani Magwaza (who signed a deal with the PO before he was forced out) in July. The agreement between SAPO and Sassa was announced on Sunday by Minister in the Presidency, Jeff Radebe, chair of an Inter-Ministerial Committee established to mop up Dlamini’s, her ministry’s, her department’s and Sassa’s mess. Dlamini, unsurprisingly, did not attend the landmark announcement. She was out campaigning furiously. In a race against time it took civil society (specifically the Black Sash), the Constitutional Court, a court-appointed panel of experts, the Standing Committee on Public Accounts (Scopa) and the Inter-Ministerial Committee to find a solution that would not see CPS being provided with a “back door” to the new deal. Parliament’s Standing Committee on Public Accounts chair, Themba Godi, on Monday welcomed the deal, saying it brought an end to the uncertainty and anxiety of grant recipients and the nation at large. Godi said that Scopa felt vindicated that its relentless persistence had finally yielded a positive outcome. SAPO CEO Mark Barnes, speaking to 702’s Stephen Grootes on Monday, said he was “happy” with the deal and that it was a step forward towards building an asset for the state that would reduce reliance on “outside bodies” like CPS which were more concerned with producing returns for shareholders. SAPO and Post Bank would be serving the public rather than those hiding in the financial architecture. He said the Post Office would act as an anchor in the system while Post Bank would be the vehicle of delivery, although not exclusively. Currently 1.4-million beneficiaries receive their social grants through commercial banks and these would continue to offer support services. Post Bank, established 140 years ago, has 5.8-million clients, is an operating bank with standards and a member of the National Payments System and is perfectly placed to undertake the massive task. Barnes said that indicators in the Post Office were “up significantly” but there was a difference between delivering letters and parcels and money. Post Bank would manage grants, not the Post Office itself. The fee SAPO would charge Sassa – R12.41 – would be “cheaper” than CPS and was within budget. The most expensive part of the Sassa grant system was the cash payment to recipients in rural areas. This the Post Office could do as SASSA and SAPO pay-points overlapped. There would be no transaction fees for withdrawals at SAPO ATMs. A further benefit to Sassa in using SAPO would be that interest would accrue to Sassa and not commercial banks. Radebe announced on Sunday that beneficiaries would be paid through four key channels – through commercial bank accounts of beneficiaries’ choice; through merchants in large retail shops; through Postbank as well as “second tier” merchants including small retail outlets, spaza shops and co-operatives that are “legally registered and South African-owned and -operated”. The Build-Operate-and-Transfer Model allowed the investment made in SAPO to be transferred directly to Sassa after five years. This would be done, said Rabebe, without breaching contractual agreements between the government and private sector parties. SAPO would provide banking services, including a central holding account and special disbursement accounts, the “on-boarding” of new beneficiaries, biometric authentication of beneficiaries, and development – in conjunction with such other state capabilities as may be required – of the required software solution to replace the “incumbent” systems. SAPO will also disburse cash through its branch network. Radebe said Sassa would now have to provide SAPO with all information required to make the payments, a beneficiary payment file prior to the grant being paid, beneficiary biometric and biographic data as well as “the provision of the funding for the payment of social grants, providing SAPO with reasonable assistance in order to render the services”. The first phase of the transition would be the exit of CPS in April 2018, followed by phase two (in the second and third year), which is the implementation of the hybrid model which addressed Constitutional Court directives, and phase three (in the fourth and fifth year) which would be the development of Sassa insourcing infrastructure. There are still, however, a few unanswered questions and potential pitfalls that may trip up the process. The most important will be whether Sassa itself has the capacity to undertake the massive task considering earlier findings by the panel of experts that the agency is hopelessly deficient and inefficient. The second report to the ConCourt by the panel of experts will be delivered in January and will no doubt set out, in no uncertain terms, the pros and cons of the agreement between Sassa and SAPO. The Black Sash, while it welcomed Sunday’s agreement, pointed out that there were still “gaps” that needed to be addressed urgently. Speaking to Cape Talk, Black Sash National Director, Lynette Maart, said a concern was still the cash payouts which were “still up in the air”. Maart said this aspect might still be subject to an open tender for a year. Of concern was that the current process had taken so long that the cash payments issue might not be resolved before 31 March 2018. There were also questions, said Maart, with regard to the details of the special SAPO disbursement account and what its features would be. Another concern was the lack of a dispute resolution mechanism. Also, the agreements with commercial banks had also not yet been finalised.